Sometimes good fortune comes in waves. For the second time in as many months, we’ve been blessed to find a photographic image of a long-ago ancestor. First it was a great-great grandfather, Philipp Treutel, whose faded image on a carte de visite came from the 1860s. Now we’ve been given a studio photograph of another great-great grandfather, Joseph Ladick (1846-1905). Along with a group photo taken at a wedding, for the first time we have two images of the senior Ladick. Both of these family patriarchs come from the tree of my grandmother, Ruby (Treutel) Hanneman (1904-1977). The wedding photo above was taken on September 22, 1890 at the marriage of Joseph Chezik and Mary Moravets. Joseph Ladick is at left rear, and we believe his son, Joseph, is at right rear. The portrait below of Joseph Ladick Sr. is undated. Joseph Ladick brought his family to America from Bohemia in June 1881. We believe the Ladick family is native to Bilina, a city northwest of Prague in the modern day Czech Republic. They sailed aboard the SS Silesia on May 22, 1881 from Hamburg, Germany. The ship register lists their residence as Ronkovic, Austria. There does not appear to be such a place, so I examined the written document and the writing is very hard to decipher. There are a number of villages near Prague in Bohemia that could fit what is written on the register, including Radonitz, Raudnitz, Rakonitz and Radnitz. The exact location might remain a mystery, but it seems clear the family was living in northwest Bohemia at the time of their emigration. Sailing aboard the Silesia in May and June 1881 were Joseph Ladick, his wife Mary (Mika) Ladick, and sons Joseph, 6, and Frank, who was an infant. They reached New York on June 5, 1881. We don’t know their path to Wisconsin, but it probably included sailing the Great Lakes and possibly some rail travel to Milwaukee. They settled on a farm in the Town of Sigel in Wood County. Shortly after the Ladicks settled in Wisconsin, their daughter Mary Helen was born (December 28, 1883). Later children were Anna (1886) and Celia (1891). Frank married Mary Mras (1898). Anna married Harry Victor Cole (1903), and Celia married Oscar Goldammer (1908). Son Joseph died of pneumonia in November 1894 at age 19. He was buried at the St. Joseph Cemetery near Vesper. The 1881 SS Silesia ship register shows the Ladick family: Joseph, Mary, Joseph and Frank. The day after her birthday in 1902, Mary Helen Ladick married Walter Treutel of Vesper. The Treutels were transplants from the Town of Genesee in Waukesha County. They settled in Vesper, where Walter became a rural route postal carrier for the U.S. Postal Service. 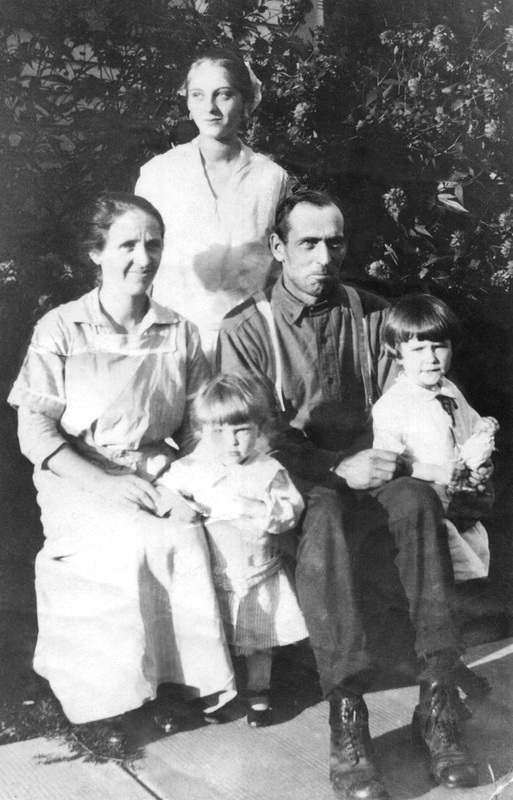 Walter and Mary’s first child, Ruby, was born at 1 p.m. on June 22, 1904, delivered by Dr. F.A. Goedecke. The couple would later have four other children: Gordon, Nina, Marvin and Elaine. Joe Ladick was actually buried at Holy Rosary Catholic Cemetery in the Town of Sigel. His is one of the earlier monuments in the cemetery. On a recent trip to the area, we cleaned his marker using Treasured Lives RestoraStone™ process, which removed biological growths, dirt and air pollution from the stone. Now, thanks to a generous cousin, this beautiful stone is no longer the only visual history we have of him. The grave marker of Joseph Ladick Sr. at Holy Rosary Catholic Cemetery, before being cleaned and restored (left) and after treatment (right). I’m generally not a fan of social media page “likes” or shares or fan praise. While it is one metric of success in the online world, it also can set us up for easy disappointment. That being said, I was quite pleased to see my grandparents’ wedding photo draw such nice comments on an Instagram page dedicated to preserving the stories behind photos. I submitted the photo to Saving Family Photos from Treasured Lives, our sister site. If you are on Instagram, find them @savefamilyphotos. You can also see the gallery on their web site. A simple family snapshot taken around 1918 is the only photograph we have showing Walter Treutel and his wife Mary (Ladick) Treutel together. Taken at the Treutel home in the village of Vesper, Wisconsin, the photo shows a teenaged Ruby along with younger siblings Marvin, 2, and Nina, 4. 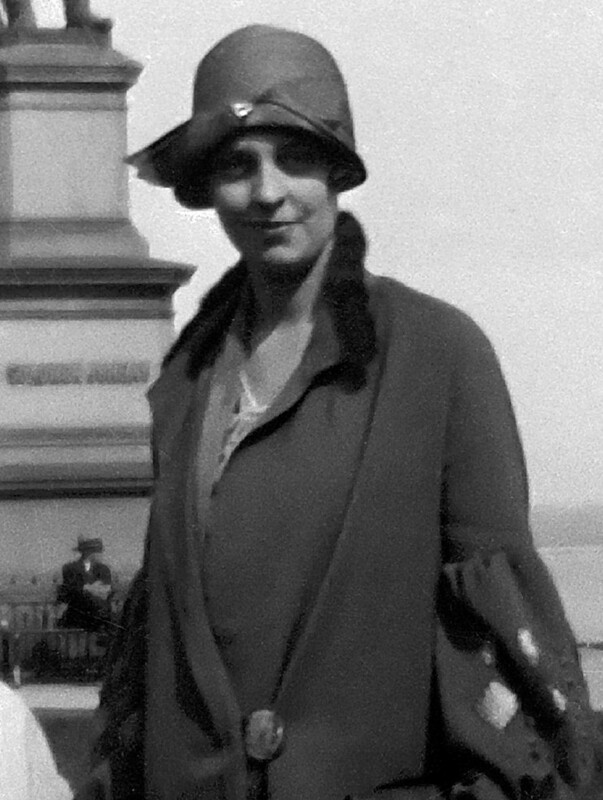 Elaine Treutel would come along in 1920. Baby Gordon Treutel died in 1910. Walter was a rural route postal carrier for the U.S. Postal Service, while Mary tended to the family home on Anderton Avenue. The couple were married on December 29, 1902 in Vesper. Walter had recently relocated to Vesper from North Prairie in Waukesha County. Our Grandma Ruby Viola (Treutel) Hanneman was their first child, born June 22, 1904. Ruby was born at 1 p.m., delivered by Dr. F.A. Goedecke. We learned recently that Mary’s nickname was Molly. That factoid came from none other than cousin Mary “Mollisu” Clark, the daughter of Elaine (Treutel) Clark and Max Clark. Mrs. Treutel died at just 42 years old in January 1925. She had an operation in nearby Marshfield, but a post-operative infection claimed her life on January 31. She did not live to see her daughter Ruby get married that summer, and she did not get to see her other three children grow into adulthood. The uncropped version of the photo shows Ruby V. Treutel standing at rear. Mary and Walter Treutel are seated. In front are Marvin and Nina Treutel. Eight uniformed, ax-wielding men and their sword-bearing commander grace this photograph from Vesper, Wisconsin, circa 1910. The men were Foresters, a ceremonial drill team from a fraternal group called the Modern Woodmen of America. The Woodmen organization dates to the 1880s. It was formed to provide financial relief when the family breadwinner died. Drill teams would participate in parades and at other public functions to promote the group and show patriotism. At farthest left in the photo is Walter Treutel (1879-1948), father of our Ruby (Treutel) Hanneman (1904-1977). The fourth man from the left is Orville Carlin (1874-1934), Ruby’s uncle. Walter was the longtime rural-route postal carrier in Vesper. Orville operated a butcher shop and meat market at Vesper before moving his business to nearby Arpin. He was the husband of Walter’s sister, Emma (Treutel) Carlin (1877-1962). George E. Martin was president of the State Bank of Vesper, chartered in December 1911 with capitalization of $10,000. Owen Oliver was vice president and Burton Jones was cashier. It is not clear if these are the three gentlemen shown in the photo. The bank made slow progress at first. A new management team was put in place in 1913, with Vesper hardware merchant George H. Horn serving as president, farmer Arthur P. Bean vice president and Fred Ellsworth cashier. According to the 1923 History of Wood County, Ellsworth sold his share in 1919 to three investors from Wisconsin Rapids. The bank subsequently grew from $55,000 in deposits to $140,000 and was considered one of the strongest country banks in the area. Grandma Ruby (maiden name Treutel) grew up in Vesper. Her father Walter Treutel was a longtime postal carrier. Several uncles operated a butcher shop, general store and blacksmith/carpentry shop in the village. Her aunt Emma was postmistress for nearly a decade. We only have two photographs that show Carl F. Hanneman at school, and both appear to be from the same year. 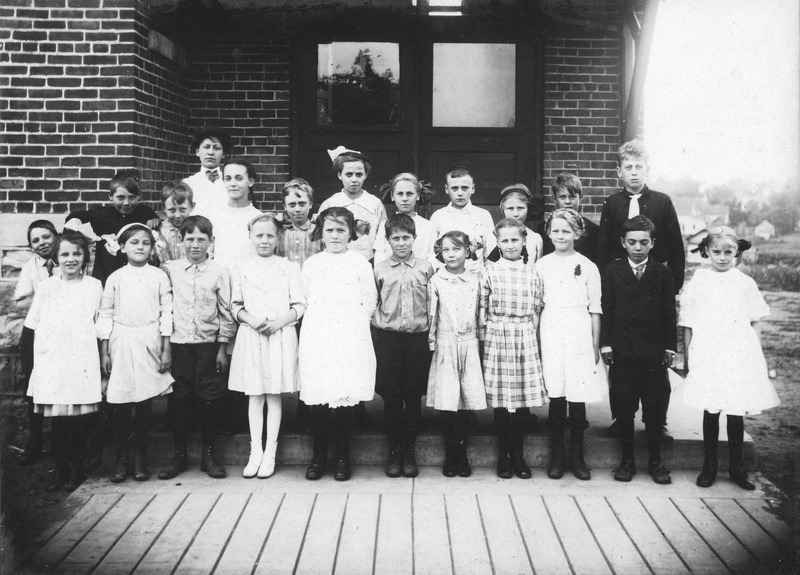 In the first, Carl is the second pupil in the second row at a school in Grand Rapids, Wisconsin. Wearing a tie and cardigan sweater, Carl is one of a half-dozen or so boys in the class. The clock reads 11:59, so the class photo was scheduled just before the lunch break. It is a well-kept and neatly appointed classroom. The girl sitting in front of Carl could easily be mistaken for his future bride, Ruby V. Treutel, although she went to school in nearby Vesper. Carl F. Hanneman is third from the left in the first row. The photo was taken circa 1910. The second photo was taken outdoors at an entrance to the school. Carl is third from the left in the first row. At the time, the Hannemans lived on Baker Street in Grand Rapids, so the Howe School would have been the closest public school. But the building in the photo does not match exterior details of the Howe School, so it’s unclear where Carl spent his elementary school years. Her reign may have been brief, but for one day in 1922, Ruby V. Treutel was front-page news as the most popular single woman in Wood County, Wisconsin. To help celebrate dedication of a new bridge across the Wisconsin River, the community organized a popularity contest to find the Queen of the Bridge. The Queen of the Bridge contest invited the nomination of single women of Wood County. The contest winner would preside at the dedication of what came to be called the Grand Avenue Bridge, linking the east and west sides of Wisconsin Rapids over the Wisconsin River. Queen of the Bridge wasn’t really a beauty contest, but Ruby Treutel would have fared well on that count alone. Ruby Treutel was in the thick of it at the beginning, but eventually fell behind in voting. 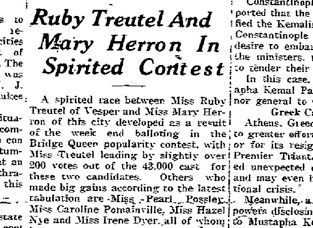 Ruby’s 22,570 vote total was more than twice that of the third-place contestant and far ahead of the 10 votes for Miss Pearl Brewster. But, like fame and money, the lead would not last as the contest balloting steamed along for two weeks at such a rapid pace the contest was ended early. In the first week, more than 1.3 million ballots were cast. The Bridge Committee had trouble keeping up with the tallying, which would exceed 20 million votes by the end of the contest. Miss Herron was crowned Queen of the Bridge. On Oct. 18, 1922, she attended the huge dedication ceremony and officially christened the span the “Grand Avenue Bridge.” It was indeed a grand event, with thousands of people, a parade and even aerial acrobatics performed by the Federated Flyers stunt team, which did loops in the sky with its planes, and thrilled the crowd with wing walking. This 1940 postcard shows the Grand Avenue Bridge in Wisconsin Rapids, Wis. The Grand Avenue Bridge has long been an important part of Wood County’s infrastructure. The 1922 version replaced an old wood and steel span. Bridges across the Wisconsin River date to the 1870s. In earlier times, bridge was an important link between the former towns of Grand Rapids and Centralia, which later joined to form the city of Wisconsin Rapids. 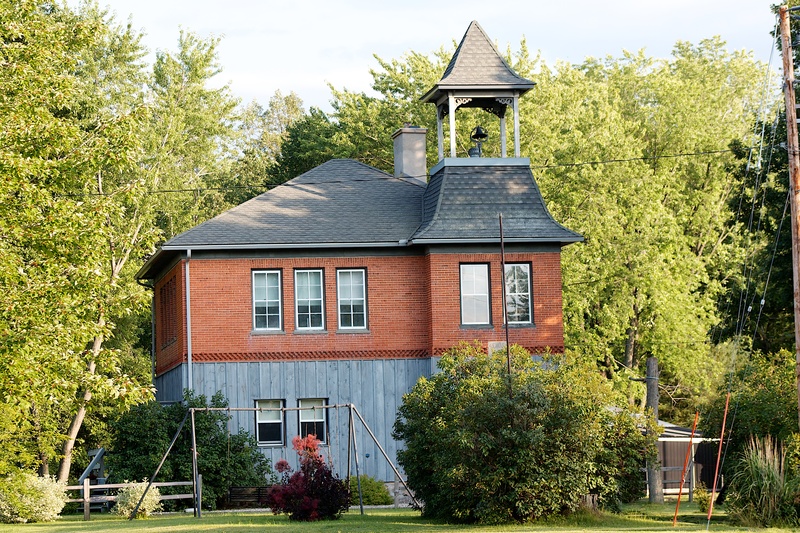 In a state where the one-room schoolhouse was quite the norm in the early 1900s, tiny Vesper, Wis., boasted an impressive two-story brick school building that was the center of learning for area children for decades. Built in 1906 just off of Main Street in Vesper, the Vesper Graded School was home to students of District No. 1, Town of Hansen. 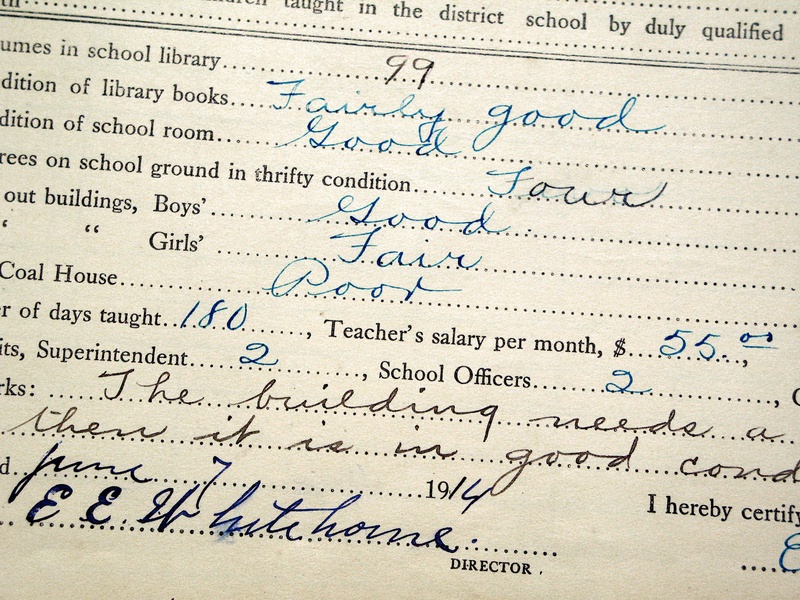 We get an interesting look at life inside the school from a teacher’s record book covering the years 1911-1917. The “Welch’s System Attendance, Classification, Gradation and Close Supervision” book belonged to Ruby (Treutel) Hanneman, who attended Vesper school starting in 1913 and later taught at the school. 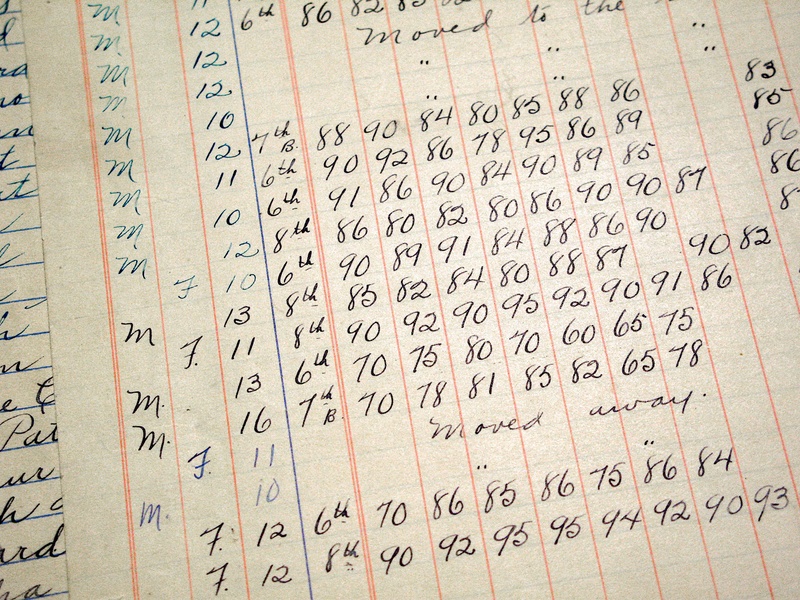 The teacher kept detailed notes on conditions at the school, in addition to records of student performance and attendance. The detailed notes in the book make one thing very clear: the teacher had her hands full each school year. Not only did one woman handle teaching duties for lower and upper grades, but she had to manage the building and contend with a cranky, bulky coal furnace each winter. During the years covered in the record book, Vesper had three teachers: Mabelle Rowland in 1911-1912, Ella H. Hessler from 1912-13 to 1914-15, and Sara Icke in 1915-16 and 1916-17. Teachers were paid between $50 and $60 per month. Ruby’s uncle, Henry Treutel, served on the school board in early years (his son Harold attended classes during that time). In the late 1920s, another uncle, Charles Treutel, was also on the board. It seems the biggest challenge for the teachers was not in the classroom but the furnace room. The coal-fired furnace often belched smoke and gases into the clean-air intake and into the classrooms. 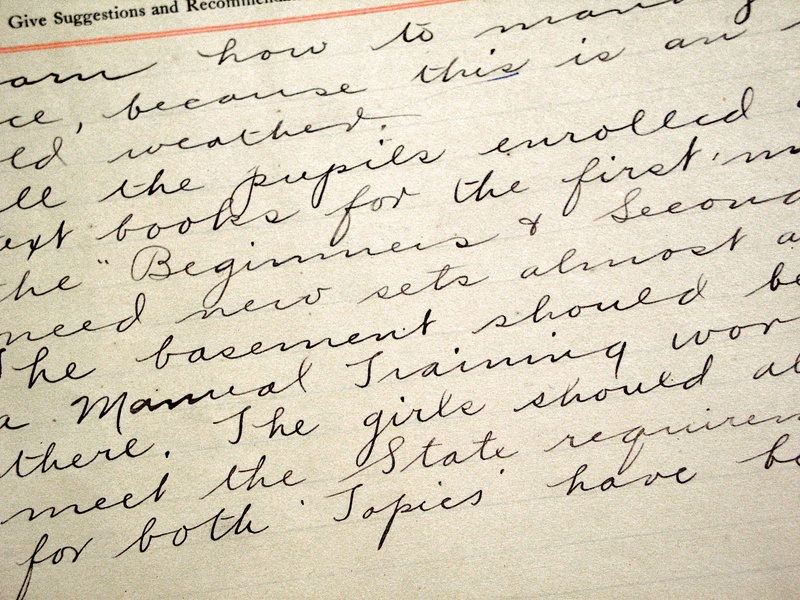 “Before you begin school learn how to manage the drafts of furnace and cold air shafts,” wrote Mabelle Rowland in her 1912 “Teacher’s Report to Successor.” “The inspector is very critical on this work.” Teacher Ella Hessler wrote one year later: “The furnace needs repair. The smoke enters the fresh air. The furnace work in cold weather is too heavy for a woman.” Similar notations were made in subsequent years. Each student’s attendance and academic performance were tracked in detail. The school typically served from 25 to 40 students per term. Primary grades were on one level and upper grades on the other. The teacher staggered the subjects so she could get lessons started for one group and then move to the other. Classes started at 9 a.m. and students were dismissed for the day at 4 p.m. Course work included arithmetic, history, language, reading, grammar, physiology, domestic science for girls, manual training for boys, civics and geography. Some of the children walked to school from homes nearby in the village, while others came in from the countryside. Tardiness was common, due to distance walked, duties at home or a pokey walking pace. In 1911-1912, Alfred and Agnes Peterson were the brother-sister tardiness champs with 20 and 17 instances, respectively. 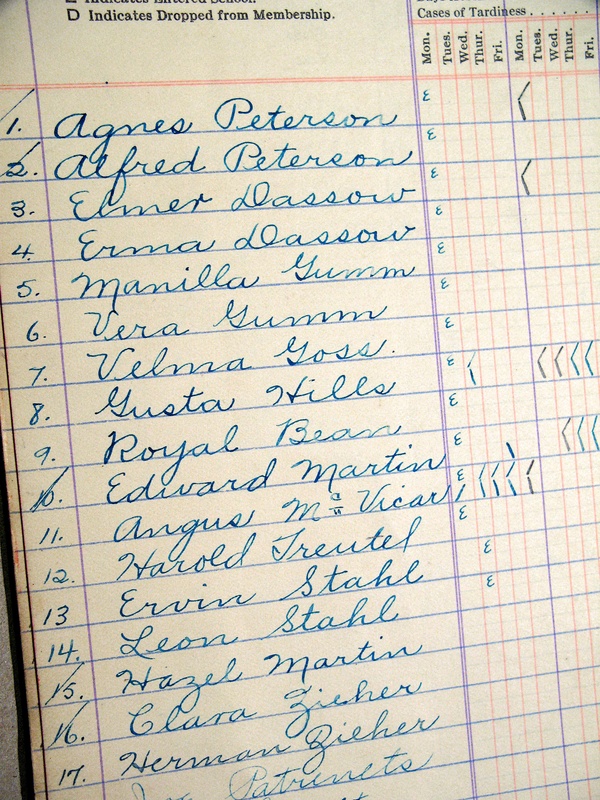 Clara Zieher had 18 tardy notations, followed by Erma Dassow with 15 (her brother Elmer had just 4). Absence from school was also common due to illness or duties helping at home. On occasion a student or two left school for a month or two to perform farm work. Arnold Conklin had best attendance in 1911-1912, only missing one day out of 180. Absences were common from illness or need to stay home and work on farm chores. In the 1911-1912 school year, the school library had a mere 50 volumes. The school invested in books each year, and by June 1917 the library’s holdings included 144 books. For obvious reasons, the boys’ and girls’ out buildings regularly needed repairs and painting. The number of trees on school grounds that were in “thrifty condition” ranged from four to seven. Ruby Treutel enrolled at Vesper Graded School in November 1913, when she was 10. There was some indication she had attended a parochial school prior to that. During her first year, Ruby missed 21.5 days and was tardy six times. Her cousin Harold Treutel had a mere three sick days. Ruby received good grades for the term: orthography, 91; reading, 95; writing, 90; arithmetic, 70; grammar, 89; geography, 83; and constitutions, 90. During the 1914-1915 school year, Ruby was out sick 20 days, but she still maintained As and Bs in all of her subjects. The teacher’s annual summary provides interesting detail on all conditions at the school. During the 1915-1916 term, Ruby excelled in all of her courses, scoring solid ‘A’s in orthography, reading, grammar, U.S. history and physiology. Her lowest grade was a ‘B’ in geography and arithmetic. Harold Treutel graduated from Vesper Graded School in 1917 and enrolled at Lincoln High School in Grand Rapids. Ruby graduated from Vesper in 1918, also enrolling at Lincoln High School. That may be where she first met Carl F. Hanneman, whom she would marry in July 1925. The old Vesper Graded School is now a private home, shown here in 2006.